(Cara MacDonald | The Salt Lake Tribune) Utah House District 32 candidates Brad Bonham and Suzanne Harrison debate the issues Wednesday night, Sept. 19, 2018, in Sandy. Sandy • One clear difference emerged Wednesday night in the race for state House District 32 in southern Salt Lake County: the candidates' clashing views on the ballot measure to expand Medicaid. Democrat Suzanne Harrison supports Proposition 3 as a lifesaver for thousands of Utahns. Republican Brad Bonham opposes it as a tax increase. “It will provide primary care for 150,000 people in this state who don’t currently have” insurance coverage, said Harrison. As a medical doctor, she says she sees the need firsthand on a daily basis. She also said the measure could help strengthen Utah’s economy, potentially generating up to 14,000 new jobs. “Healthy workers and healthy people make productive people and healthy workers," she said. Bonham, a business executive, opposes the initiative because it would increase sales taxes .15 percent to attract some $800 million in federal funds. Medicaid can be improved without a tax hike, he said. And he took issue with Harrison’s self-description as a fiscal conservative. House District 32 is an open seat because incumbent longtime Rep. LaVar Christensen ran and lost a bid for the state Senate. Two years ago, Christensen, a conservative Republican was challenged by Harrison and won re-election by a whisker. Harrison was ahead in the election night vote count, but by the time all mail-in and provisional ballots had been been tallied, Christensen pulled out a five-vote victory. The debate covered a variety of issues, from health care to homelessness. 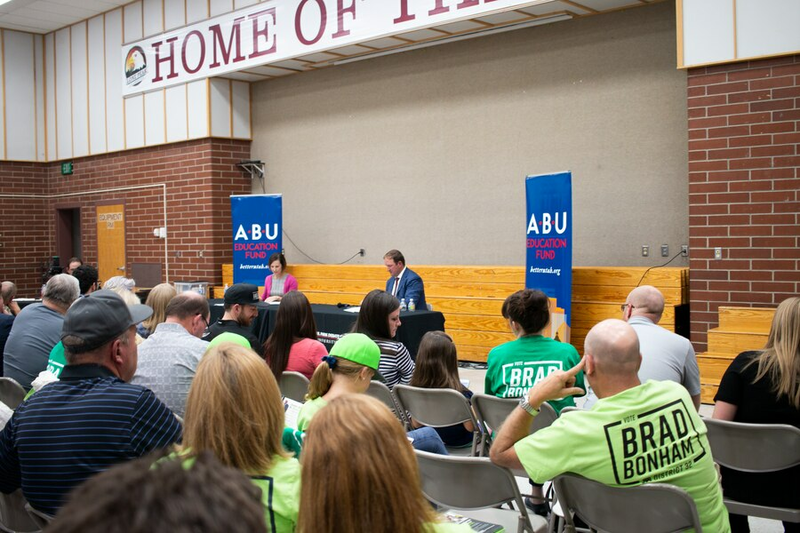 Sponsored by the Alliance for a Better Utah Education Fund and the University of Utah’s John R. Park Debate Society, the meeting drew a sizable crowd. Harrison, an anesthesiologist, emphasized her concerns about air quality, education, and making a better world for children in the Draper, Sandy and White City area. Bonham also emphasized the role of his family in his life, as he and his wife are currently raising four children. He is CEO of a company called Walker Edison, which he said employs more than 2,500 people directly and indirectly. Correction: This story has been changed from the original version to correct the size of the tax increase proposed in the ballot measure. If approved by voters, the measure would increase sales taxes .15 percent.